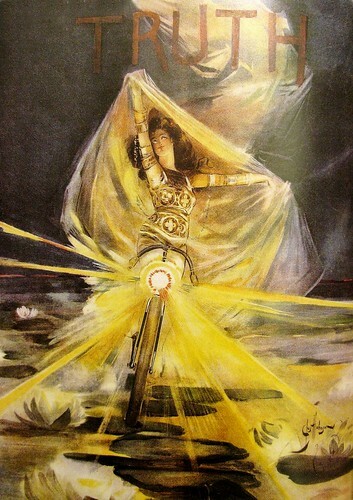 This illustration, 'The Spirit of the Wheel', was one of the many images celebrating the bicycle's liberating quality. It featured on the cover of the New York magazine 'Truth' back on 22 August 1896. The Bicycle as Truth. The two-wheeled wonder liberated the working classes and it certainly liberated women around the turn of the last century. Will it liberate us from car-centric societies? What truths apply here on the first day of 2009? - The bicycle is the most efficient machine ever invented. - Riding a bicycle does not require any form of equipment - apart from a bicycle. - It is shockingly easy to look frightfully chic on a bicycle. - Riding a bicycle in high heels and/or a skirt is quite simple [women have been doing it for more than a century, for heaven's sake]. - Anyone who actually knows what their bicycle weighs should be treated with suspicion. - Coaster brakes are chic, normal and better than those finger-squeezy gadgets. - If you had all the bicycles on the planet lined up in front of you, you wouldn't be able to see a racing bike or a mountain bike to save your life. They would drown in the mass of normal bicycles like the ones you see on this blog. - Cycle Chic will continue growing throughout 2009. Taking back the bicycle culture for regular people on regular bikes all over the world. I love old artwork..it has a flair of enjoyment and respect of life no matter the subject. Thank you for the wonderful art and 2009 Truths. I have fallen in love with my bike over the last 5 months and your blog is a daily reminder of why I love it so much. Great stuff, Cycle Chic. The magazine cover is brilliant. As we all feel the overwhelming urge to "gear up" for a new year, whether in terms of buying new stuff or simply making numerous resolves, it's good to be reminded of the fundamental simplicity underlying this marvelous machine. Cheers! Val... "usually weighs around..." is not the same as "it weighs 24 pounds, 7 ounces..."
1. A front brake stops you about 50% faster than the rear brake can. 2. If your chain breaks or derails, your coaster brake will suddenly stop working. here in Denmark two brakes are required by law. it is interesting to consider the fact that coaster brakes feature on the vast majority of bicycles in the world. good ideas spread. I doubt that second-last item on the list. What is a normal bike in some places is not normal in others. In my country, and in many others mountain bikes are normal (I ride a hybrid). China is the country that really matters in such a survey and as far as I know there is quite a saturation of mountain bikes in the cities. having travelled extensively in China, I can assure you that mountain bikes are a rarity compared to classic upright bikes.